Your baby is turning one. What a huge milestone. 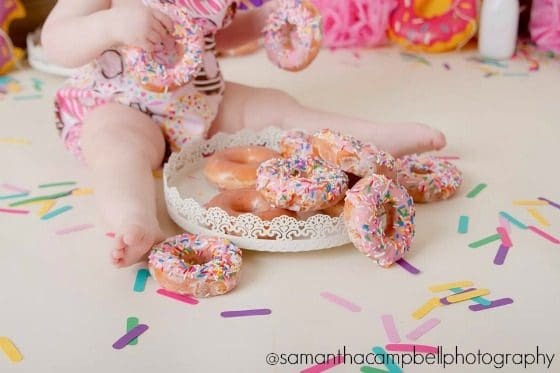 This first birthday donut party is meant to celebrate everything wonderful about that first year with your child. You made it, Mama! It’s not always easy. There are so many sleepless nights. There are tears to be dealt with – most likely from the mom and the child. However, there are first smiles and laughs to delight over. You have seen so much growth over the past year. 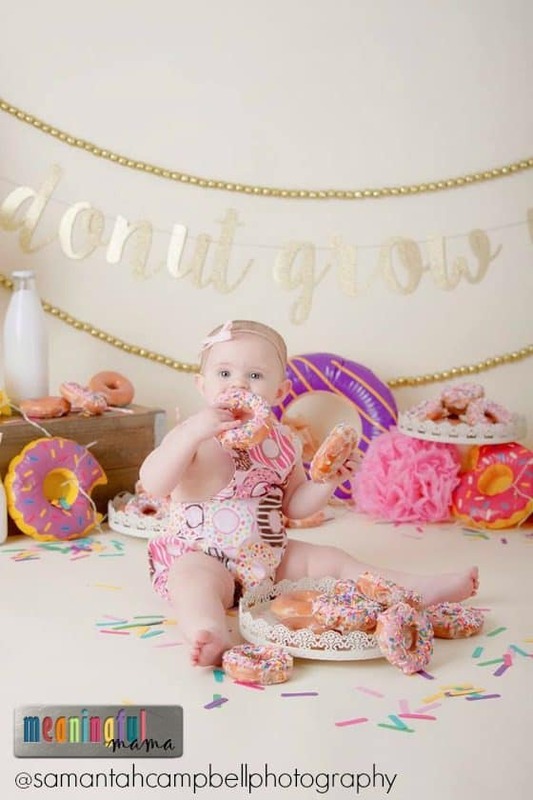 Why not celebrate all of the firsts with donuts? Looking for other party ideas? You might want to see how my sister-in-law partied with orange and pink adorable-ness. If you love throwing parties, you might just want to check out my parties tab! You also get to see some amazing “cake” smash photos today. Yes, in this case it is donut smash. Samantha Campbell is the photographer behind these amazing photos. 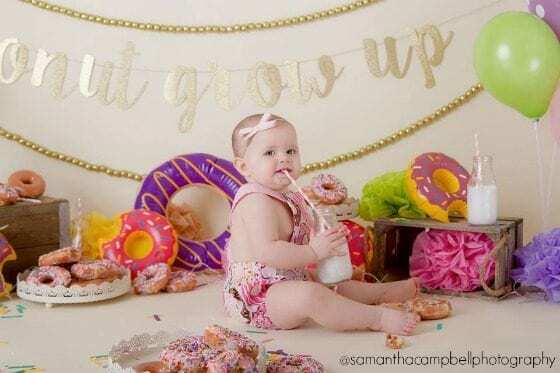 You could check out all of her cake smash photos. Adorable! What a fun business focus! This party was put on my my friend, Kristin Billiau. 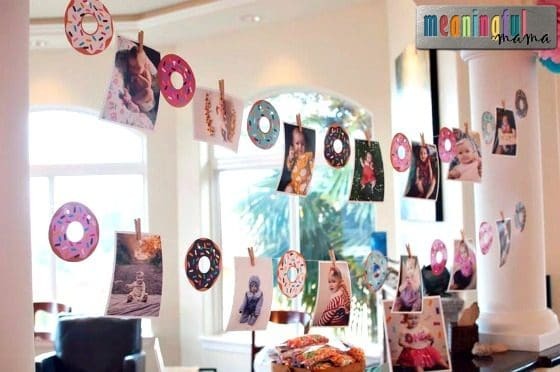 I love her composition and ideas for making her daughter’s first birthday memorable. 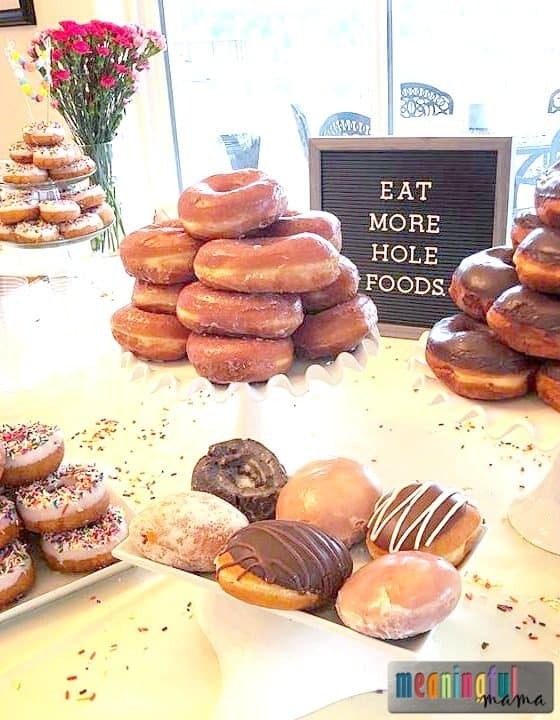 Check out the cute felt letter board that says, “Eat More Hole Food.” Super clever. I actually purchased a similar board for my sister-in-law for Christmas. There’s a longer size available in this board as well. This can be used for so many different occasions. 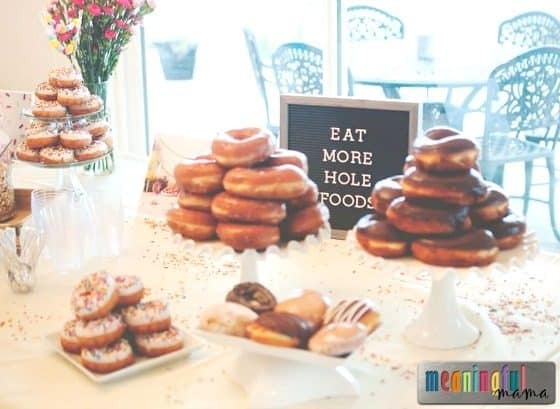 The display of donuts on the different levels of white serving platters helps create this look. The taller white porcelain stands with a scalloped edge are adorable. 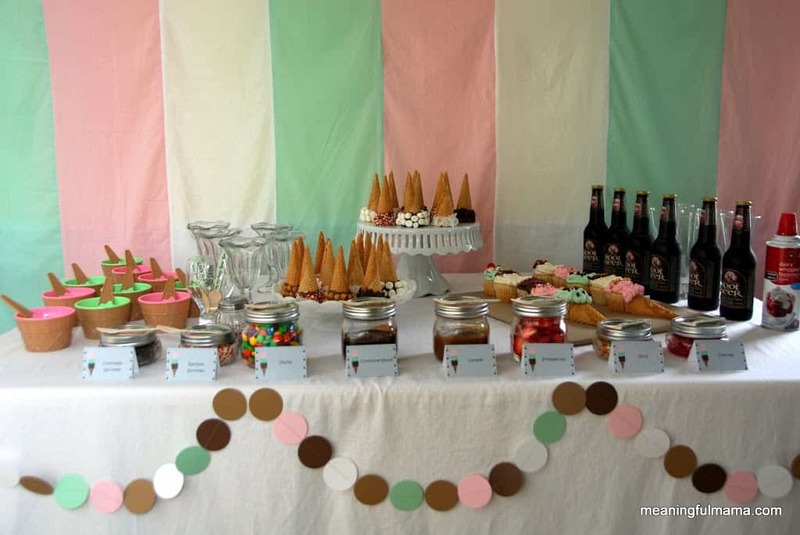 I also like the colorful confetti on top of the white table cloth . It’s such a festive addition to have the wooden cake dowels hold the pom pom garland. How adorable is this idea? 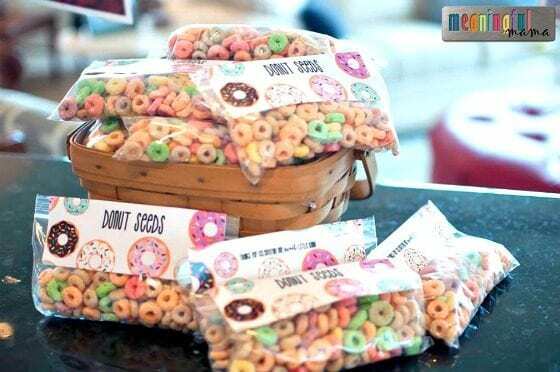 Donut seeds with Fruit Loops ? 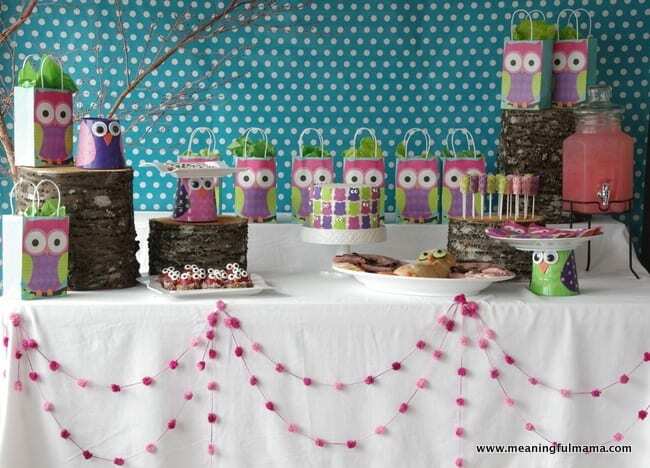 This is a fabulous little party pack for the little ones attending the party. OK – Who am I kidding? I’m an adult who will shamelessly dig in to a pile of Fruit Loops. Sprinkled letters that spell out one! Who would have thunk? 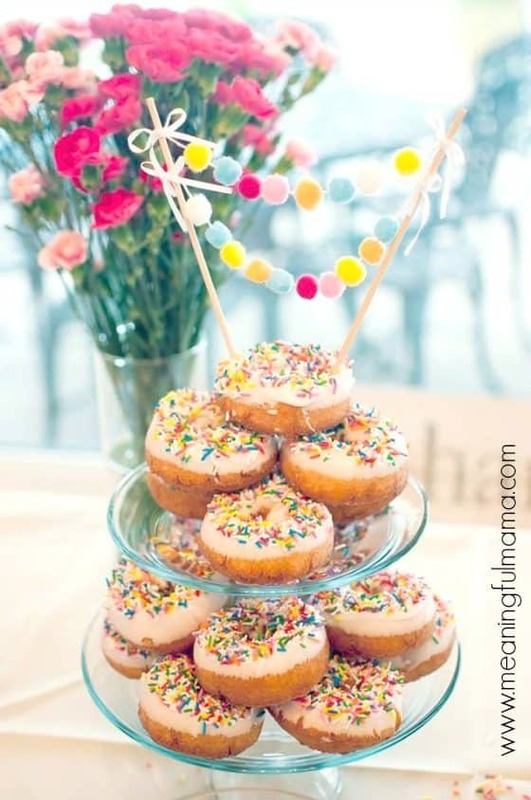 This one wouldn’t be too hard to make and would be great for either a donut party or an ice cream party. 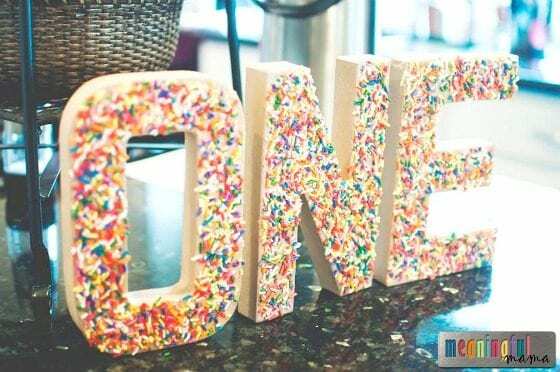 Simply take the paper mache letters and using glue, attach sprinkles . Viola! 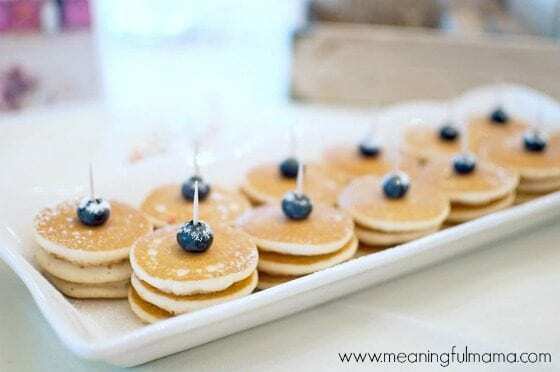 Also on the menu were pancakes. What a sweet way to serve them. I also love the thought of doing a display of the first 12 months of the child’s life. What a great way to celebrate all of the milestones! 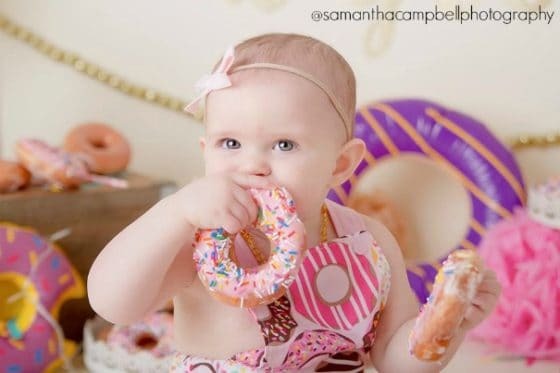 If you are looking for ideas for either a first birthday or a donut party, you have obviously come to the right place. I hope you’re feeling inspired. For more motherhood inspiration, stick around for a bit! 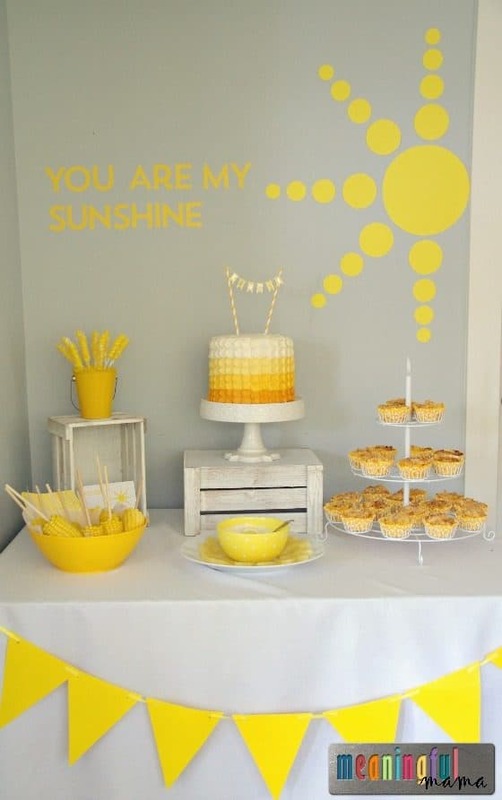 Want More Adorable Birthday Themes?